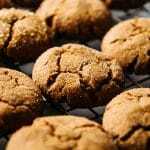 My favorite gingersnaps recipe! 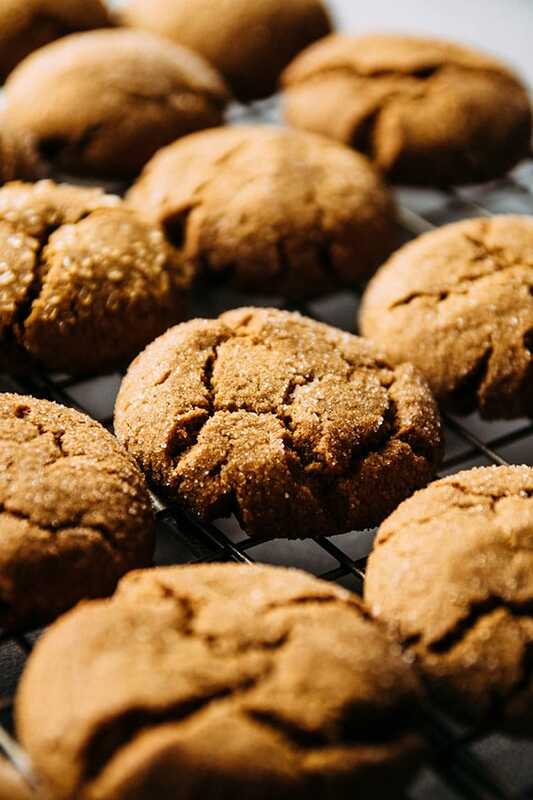 Soft, chewy gingersnap cookies with the perfect amount of spice. Vegetarian. COOKIES! Are they the best, or are they the BEST?! I really don’t share many dessert recipes on Life As A Strawberry. If you’ve been following me for awhile, you might remember that I don’t have all that much of a sweet tooth (Pasta and bread, however? GIMME IT) so when a sweet recipe DOES show up here, it’s kiiiiiiiind of a big deal. 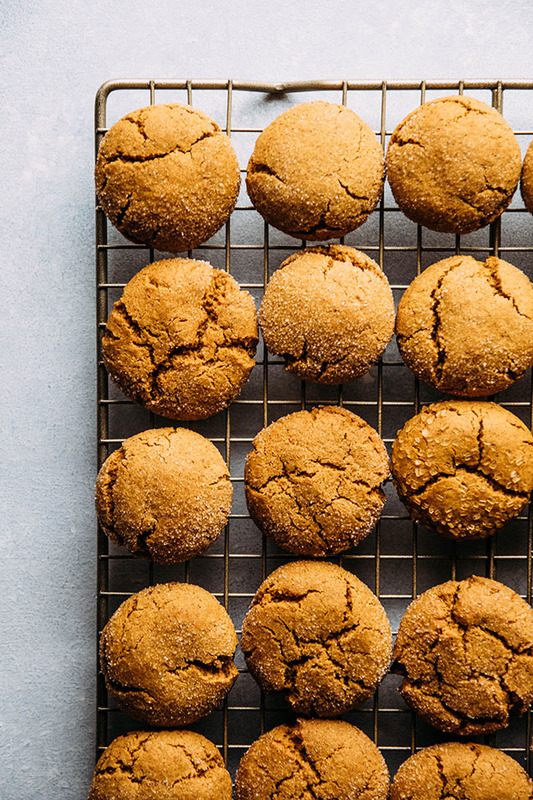 I’ve been making this gingersnap recipe every holiday season for…a decade? Maybe more? WAIT, NOW I FEEL OLD. This is actually a throwback to one of the veeeeeeeeery first recipes I ever posted on this website, back in December of 2012 (which feels like approximately one bajillion years ago, blergh). So I thought it was time to update the old old old photos from before I kinda-sorta knew what I was doing (*shudder*) with some nice, shiny, new ones. This recipe isn’t exactly, y’know, REVOLUTIONARY. In fact, it’s probably pretty similar to plenty of other gingersnaps out there on the interwebs. But everybody needs a good back-pocket gingersnap recipe, and since gingersnaps are OBJECTIVELY one of the very very best Christmas cookies, here’s my favorite version. It’s VERY forgiving, which means that you can play a bit until you find the perfect balance for your taste buds. I’ll throw a zillion notes into the recipe for you if you’d like to experiment, but short version: You can amp up the molasses or tone down the flour for chewier, flatter cookies; you can be a super-duper-cookie-rebel and roll them in turbinado sugar instead of regular baking sugar for a nice lil’ crunch; you could eeeeeven drizzle some melted white chocolate all over these babies once they’re cooled. If you’re into that kinda thing. ALSO! This cookie dough freezes really well. The baked cookies do okay in the freezer, too, but I find it’s much more satisfying to pull out the raw dough when you’re ready for it and have the whole fresh-baked-cookie experience. 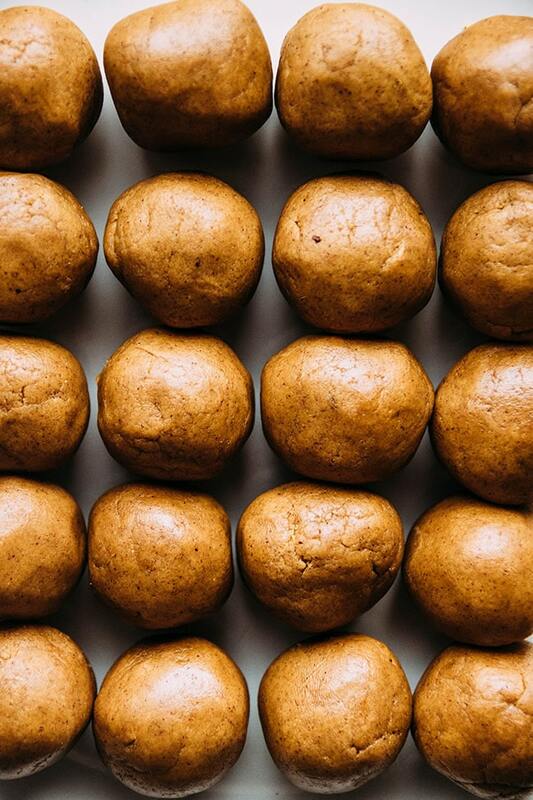 Gingersnaps are the ultimate christmas cookies! In a large bowl or in the bowl of a stand mixer, cream together the butter and brown sugar. Add molasses and egg to mixture and mix until just combined. Add flour, baking soda, ginger, cinnamon, cloves, and a pinch of salt to mixture and stir to combine. The dough is ready when all ingredients are well mixed and it holds together. Use a cookie scoop to scoop dough out of the mixing bowl in even measurements. Roll each scoop of dough into a ball with your hands (see recipe notes for some tips on this). Drop each ball of dough into your separate bowl of sugar and roll it around until the sugar covers the ball’s surface. Repeat until all dough has been rolled and dipped in sugar. Line a cookie sheet with a nonstick baking mat or parchment paper. Place sugared dough balls on cookie sheet, leaving 1-2 inches between each piece (cookies will spread out a bit as they bake). You will likely need to use two cookie sheets or to bake in batches. Bake cookies at 375 degrees F for 8-12 minutes until the tops are lightly cracked. Remove cookies to a wire cooling rack. Serve immediately or store in an airtight container on the counter for 4-5 days. I use a 1-2″ cookie scoop to measure my gingersnap dough, which results in cookies between 2-3″ in diameter. For a larger scoop, you may need to extend the cooking time (see below). If the dough is sticking to your hands as you roll it into balls, splash some water over your fingers to help the dough not stick so much. If you want, you can skip the sugar-dipping step and freeze the rolled dough – just defrost and roll the dough balls in sugar whenever you’re ready to bake them! 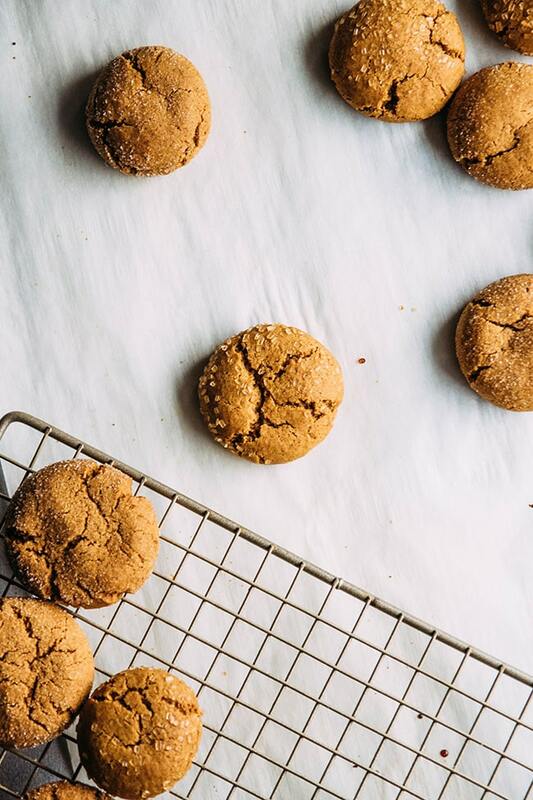 Bake time will vary by the size of your gingersnaps and your personal preferences between chewy and crispy cookies (I love chewy gingersnaps!) For smaller cookies (with a 1″ cookie scoop) 8 minutes is usually plenty of time. For larger cookies, you may need 10-12 minutes. For chewier cookies, use a slightly shorter bake time. For crispier cookies, use a slightly longer bake time. I recommend baking 1 or 2 cookies as a “test batch” to get your timing right (ovens can vary so it’s always good to test!) before diving in with the rest of your baking. These cookies don’t spread out a whole lot while baking, so they can be a bit puffy. If you’d like a flatter cookie, simply press each ball of dough down lightly with your fingertips when you place the dough on the cookie sheet before baking. This is a pretty forgiving recipe – feel free to adjust the amount of spices or add a splash more molasses to suit your personal tastes. As always, please be careful when adapting a recipe as significant changes don’t always taste great. I guess this is meant to be a “Christmas Cookie” with all the warm spices, but I think that beginning of April is as fine a time to make a gingersnap cookie as any other time! haha! Just finished baking these and wanted to let you know that they turned out wonderfully — full of flavor, nice and chewy, and just the perfect size. Thanks for the great recipe! These were AMAZING! 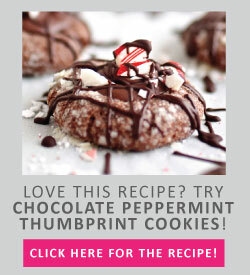 I’m definitely looking forward to trying more of your cookie recipes! I’m so glad you liked them! These are one of my top five favorite cookies. Thanks for letting me know how they turned out! These are fabulous and the photos are amazing! I love the fact that you can freeze the dough ahead of time and defrost before baking. I’m always running so far behind that I should make a batch of dough, freeze it, and then pull it out to make the day of a party. Thanks!